GM Kang Sin Sin played the Muk Yan Jong 2 days before he got the stroke. He tested the iron made Muk Yan Jong equipped with wooden spring arms which was almost completed. Afterward, we practiced Chi Sao for almost 2 hours. That night, he seemed very healthy and always wanted to keep practicing. No sign at all that he would fall asleep and never wake up, leaving us all of his family and disciples behind. 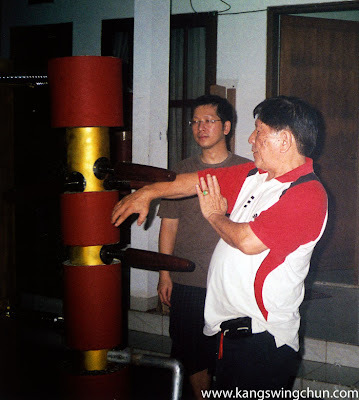 The picture was taken in his Wing Chun private training location in Jakarta, Indonesia.